Why do public bathrooms make us cringe, and why aren’t we improving their design? How many times have you cringed when walking into a public restroom? If you’re like most people, your answer may be: Every time. Blogging about bathrooms isn’t the easiest subject. The truth is… It just feels so personal. That being said, how can something so personal be designed so poorly the majority of the time? Not long ago, furniture giant IKEA surveyed 12,500 Americans about working from home. Astoundingly, 68% responded that using their own bathrooms was the main reason they would want to have a home office! Their issues with employer public bathrooms ranged from privacy and sound issues to cleanliness. This says everything about the need for better user experience. There’s no “rest” to be had in a public restroom. We’re taught from a young age that talking about excrement is pretty much taboo. In fact, many of us still use the code words “Number One” and “Number Two” to describe what goes on in the bathroom! As adults, we care deeply about what others think of us and strive to be as civilized as possible. 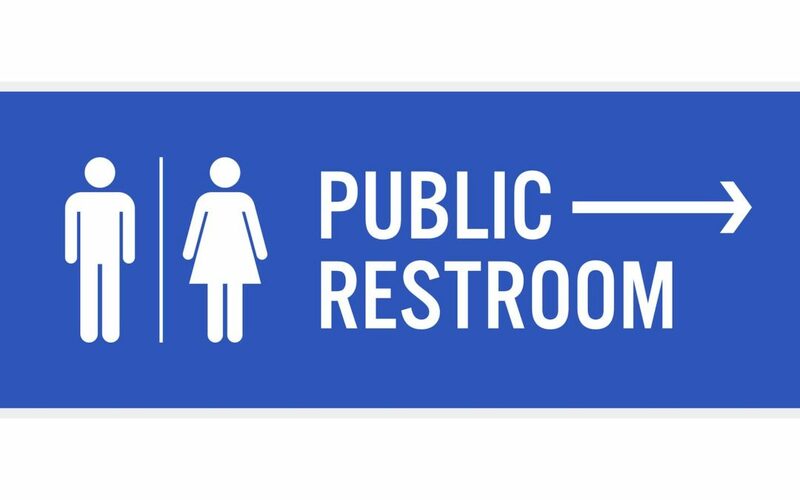 So it’s no surprise that when approaching the door to a public restroom, fear and anxiety overtake us. We’re entering a zone where very private moments must be carried out in a very public space. Some people feel so uncomfortable in this situation that they will actually wait until they get home to use the bathroom. They may even change their behavior, opting not to eat or drink while out, to avoid the unpleasant experience altogether. As humans, we have a need for privacy and public bathroom design does not meet this need. Bathroom stalls in the US afford very little privacy, especially in contrast to those in other countries. While many other countries provide solid enclosures for privacy reasons, our stalls tend to have large openings at the top and bottom on all four sides in addition to gaps at the panel seams. It’s no wonder we feel on display in our most private moments. The fact that our feet are completely exposed through the bottom opening of the stall leaves no question about who is inside. If you’ve ever felt the dread of seeing your boss’s shoes in the stall next to you, you know exactly what I’m talking about. Fancy does not mean functional. You may not be familiar with the term “human centered design”, but examples of it are all around you, all day long. It incorporates human behavior into understanding how to design. When a product or service is designed well, our user experience is something to brag about. Public restrooms tend to fall on the other end of that spectrum, being one of the top offenders when it comes to user experience. And no amount of pretty wall décor or high-end fixtures can help a public restroom that isn’t both pleasant and simple to use. Sure, there are nice looking restrooms out there – fancy, in fact. But when you take a close look, most of them don’t suit our needs. At all. To function properly, public bathroom design must be easy to understand, no matter what the user’s experience or knowledge has been. In other words, we shouldn’t finish washing our hands and feel confused about how we’re supposed to dry them. We shouldn’t find that access to the paper towels (which are inconveniently hanging on the opposite wall) is being blocked by someone using the end sink. Yes, this happens all the time! Just see the photo below for evidence. And when we finally get to use a towel, we shouldn’t find an electrical outlet below our dripping wet hands – also shown in the photo below. The public restroom experience may be bad enough, but electrocution should never come into play! Good design will always lessen the possibility of hazards and the adverse consequences of accidental actions. Good design also means that we shouldn’t have to exert ourselves to make something work for us. In particular, I’m talking about being able to fit into a stall. In the US, stall length is a big issue. It seems that so many bathroom designers have a real problem understanding that a human needs to fit into the distance between the toilet and the door! Far too often, doors won’t open all the way and actually come into contact with the toilets. Stalls need to be designed so that enough space is provided for the user, no matter what their body size, posture, or mobility is. I could list many other issues with public bathrooms… including how each sink needs its own soap dispenser and how white noise or music can help us feel a better sense of privacy. We could even start using single unit sinks and toilets (like those in Japan) that enable sink water to filter into the toilet tank, where it gets stored for the next flush. This reduces the amount of water used and keeps the bathroom cleaner (as your hands get washed before they touch the lock to the stall door). And the list goes on. But the truth is that human centered design needs to be integrated everywhere and it needs to be thought of comprehensively. We need to keep asking how we can improve peoples’ experiences and outcomes. It certainly can be done… even with public restrooms. Just look at Buc-ee’s, a Texas chain of super-sized convenience stores that has a cult following. This company gives public bathroom design hope, as it has won awards for having the cleanest restrooms in the country. Not only are its bathrooms immaculate, but they’re private and incredibly spacious as well. If we can build user-friendly environments like these, our days of cringing will over! Sophic Synergistics is a Houston-based human centered design firm. We help architecture companies build environments such as bathrooms, that deliver the most innovative and best user experiences possible. We’re ready to help you, so contact us today!